Microsclerotherapy is the treatment of spider veins using a sclerosant liquid or foam which is injected into the small veins, causing them to close. A very fine needle is used to inject the sclerosant into the tiny spider veins .Dr Roberts injects the veins with the assistance a magnifying light which allows better visualisation of the vessels. In the past vascular laser was used to treat spider veins, and although it worked very well on facial veins, the greater pressures in the leg meant it wasn’t effective in treating leg spider veins. We no longer offer this treatment. Microsclerotherapy is an internationally proven technique and the gold standard in the treatment of spider veins. At the Crows Nest Cosmetic & Vein Clinic we generally use Polidocanol 1% foam, to treat the smaller veins. It was initially developed as a local anaesthetic, but is now used exclusively for varicose and spider vein treatment. It has advantages over the older vein treatments like hypertonic saline, in that it is less painful, and has a lower chance of skin ulceration. 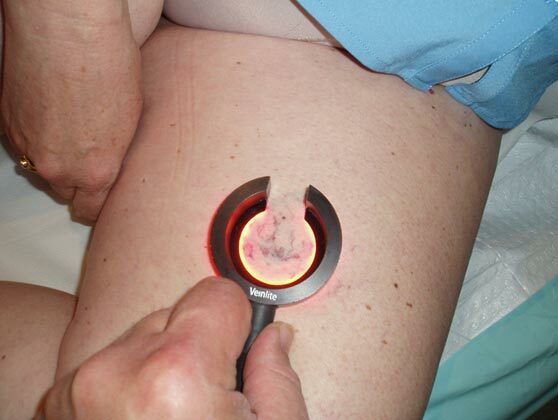 It causes less inflammation than FibroVein sclerosant, which we use to treat the bigger varicose veins during Ultrasound Guided Sclerotherapy. There is an upper limit of foam that can be used per day, (15 ml), so the number of treatments required to complete a leg depends on the size and number of spider veins, and how far the 15 ml goes. On average each leg will require 1 or 2 microsclerotherapy sessions, lasting thirty minutes per session. After microsclerotherapy grade two compression stockings must be worn for seven days, this is to reduce pigmentation and inflammation. It takes 6 to 8 weeks for the cosmetic outcome to be realised, we usually review people one month after treatment to assess progress. Bring your stockings with you at each visit. Some people find the thought of multiple fine injections a bit daunting so we can offer itrous Oxide gas to be used during the sclerotherapy sessions. It is safe to use and makes you feel very relaxed. It wears off quickly, within minutes, but driving is not recommended after its use. We are close to the train station and buses frequently pass nearby if you would like to use them. Most people find they don’t need the gas and find microsclerotherapy quite tolerable but the choice is yours. Not every spider vein will disappear. We expect a up to 75% clearance, this is sufficient to give a significant cosmetic improvement. Another session can improve the remaining 25%. Each treatment costs $480, with $90 rebate from medicare, per treatment. At the initial consultation an assessment of the number of treatments, cost, and likely outcome can be given.